Jenny Ban Creates: Hello 2013! I hope everyone had a great holiday season. My family was hit with influenza and various other illnesses in December, but we are back in action! Please check out the On Sale tab of my blog if you like A Muse Studio products. Not only do we have a super January Spotlight but the retiring products are all 30% OFF! Don't miss out on something you love--order now. If you are looking for a new business in 2013, why not become an A Muse Studio Consultant? There is a great Starter Kit Special--check out the Join My Team tab for details. I am super-excited to announce: Jenny Ban Creates Parties 'n Playdates! Please check out that tab if you have preschool-age or older kids who love crafts. I am ready to entertain your kids! I am not a big resolution maker, but the New Year always energizes and inspires me. 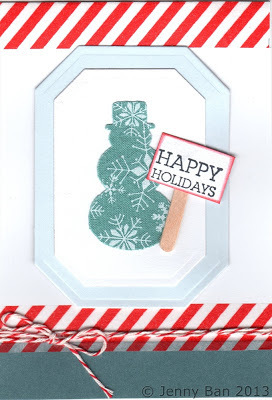 I hope to share lots more crafty stuff with you via my blog, as well as in person, throughout 2013. Check out my calendar tab for class information. I look forward to crafting with you in my newly re-designed basement craft studio! Here is a holiday card I sent out in 2012. It was so fun to make, and I am looking forward to sharing many more cards with you this year, along with other crafty pursuits.